Poetry Friday is here at last. For so many, it is time for back to school. Enjoy, this, one of the last of the summer Poetry Fridays! It is hosted today by Catherine at Reading to the Core. 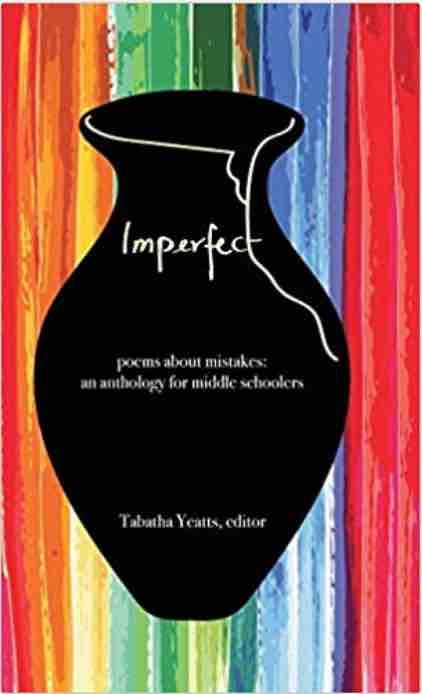 Last year was my first year doing the Summer Poetry Swap that Tabatha Yeatts created, and initiates and organizes each year. Thank you, Tabatha, for doing this. I enjoy receiving the poems from such talented poet friends. It is always a surprise, always a little mysterious and definitely makes going to the mailbox a whole lot more fun! Refrigerators can tell a lot about the person who uses it. 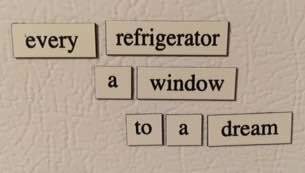 Refrigerators can tell a lot about the people the refrigerator owner hangs around with, too. Today I thought I would just share my Poetry Swaps that I sent out this summer, and a bit about how I came about writing each. The process was so much fun, and the finished product was even better than I'd hoped for. You may want to try some for Christmas gifts to family and friends. I got so carried away, I also created one for my mother-in-law up in the far reaches of Northern Maine. She is in an assisted living community, and they all work on multiple puzzles at a time up together. And now I have told you the format - the carrier - for my poems. I used puzzles. For each recipient, I went back and read many posts. Even if I'd read the posts before, I reread to remember and think. Hopefully, I would get some sense of the person behind the words and be able to put together something that was meaningful for them. Originally, I'd decided to use Tagxedo, as I had last year. I did use it once, for Keri Collins Lewis, my first swap (I received a poem from her as her first swap, also!). But then, decided to branch out and use images - either my own or theirs. 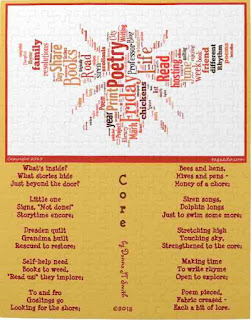 So everyone had a different experience when they read the poem and saw the image, yet had a common experience of "Poetry Puzzled". After reading the posts and checking the blog from possible images that would work, I set about writing. I jotted down "must use" words or ideas to get started. When the poem was complete, I let it sit and stew for a bit. Fat rose, and I skimmed it off. A few more skimmings and rinsings in cool water, and only the necessary words remained. It was ready to apply to an image. 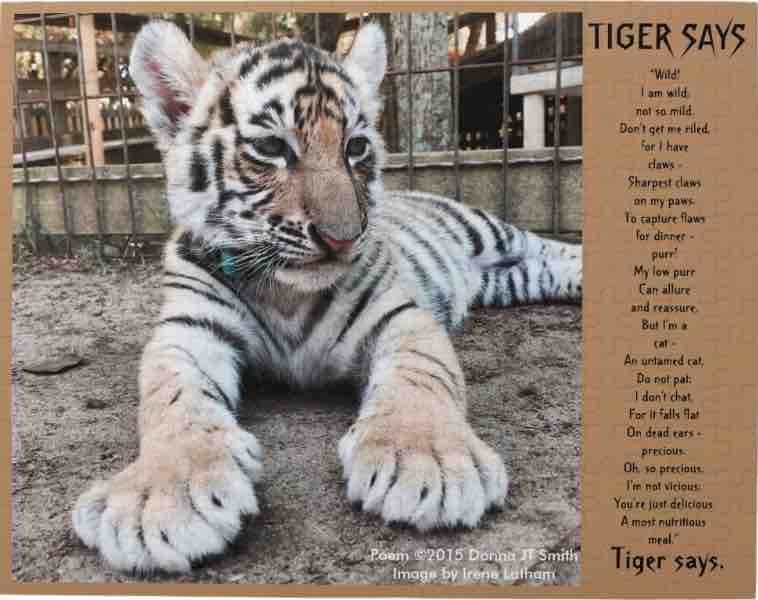 The image then was transferred to Zazzle to be placed on a puzzle template! I have a Zazzle Black account, so shipping is free, and I had each puzzle shipped directly to each recipient. Keri Collins Lewis - I so enjoyed her "other life" as a beekeeper! When I went to write her poem, I had read many of her posts and wanted to include as many little snippets of her life and posts as I could. I wanted a literal "puzzle poem", with each piece of the poem making up the whole picture. I put her web address into Tagxedo and found a bee silhouette to use as the shape of the tagxedo. Then her poem, with the Tagxedo, was arranged in the Zazzle program to make a puzzle. If you have read her blog, then you will probably (hopefully) recognize the pieces in her poem! My second Poetry Puzzled recipient was Jone Rush MacCulloch. She was in the midst of a big move when she received her poem. Hopefully, all belongings have been moved and mostly re-established in their new home! And that she has had some quiet time to construct her puzzle! 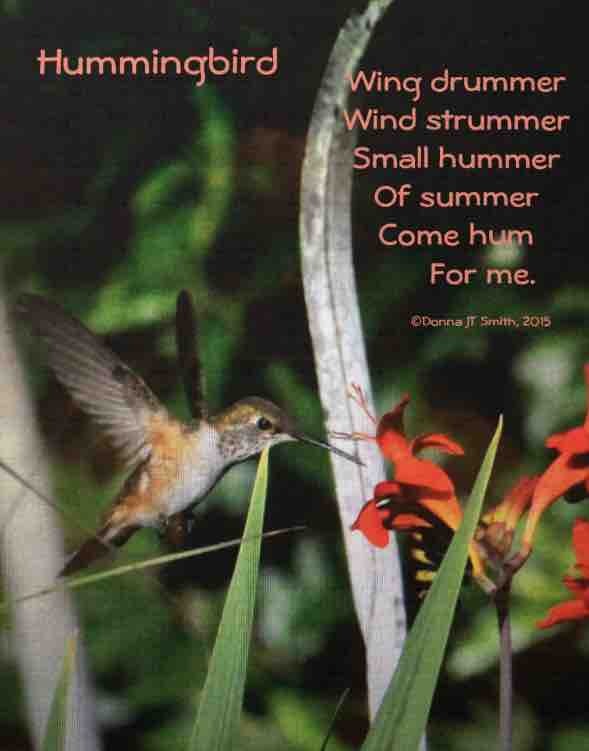 I found a beautiful picture Jone had taken of a hummingbird. 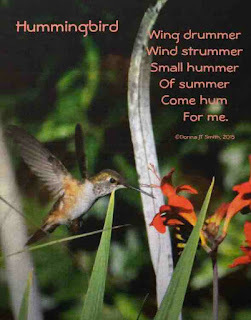 I'd been seeing a hummingbird around our house (saw him again yesterday after weeks of absence). The image with the lilies was just so gorgeous, I had to use it. I have planned a longer more involved poem, but what came out was shorter and, to me anyway, sweeter. So I went with it. 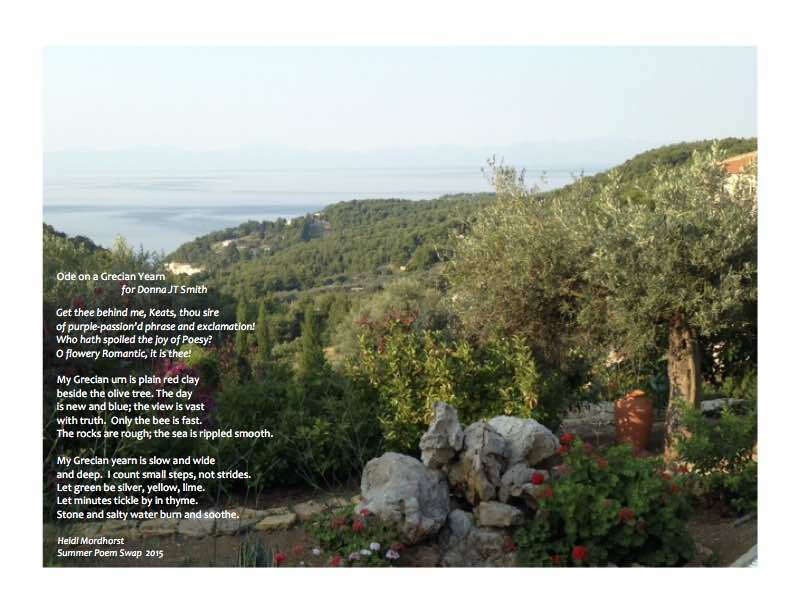 A simple combination of her photography and a poem inspired by it. 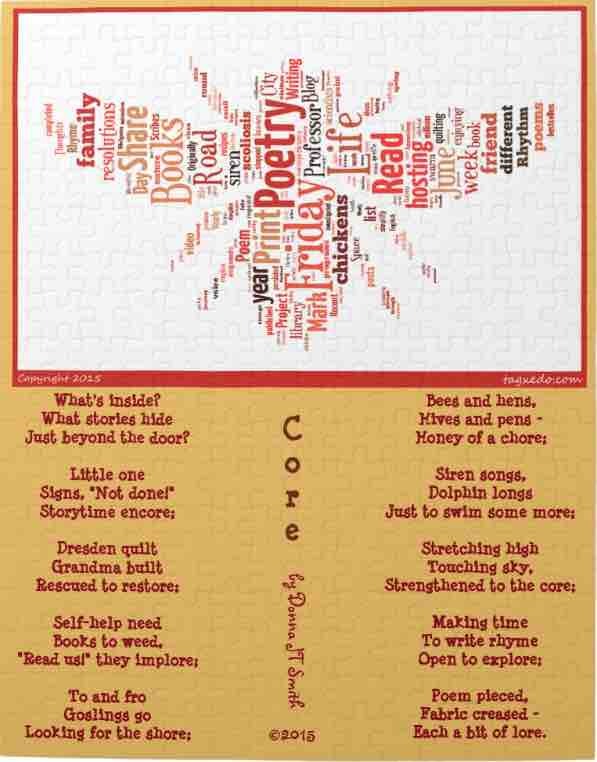 My third Poetry Puzzled poet recipient was with a long time Blogger Buddy, Linda Baie. For hers I decided that I would use an image from her site. I remembered that she had a beautiful watercolor of a bleeding heart she'd painted and posted. 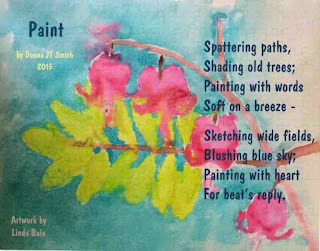 With that painting in mind, plus her 2015 One Little Word: "Paint", and her love of "painting with words", I wrote her this poem to honor her beautiful talent of "painting with heart". Joy Acey Frelinger was my next swap. Now, Joy has very few photos on her site and it is filled with children's poetry. 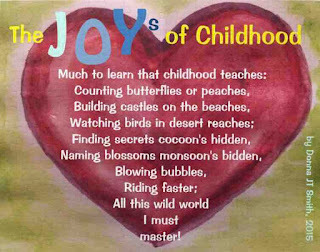 Not a lot of bio to get except that she has a wonder, joy and heart for all writing, and especially poetry, for children. I read a lot of her poems, gleaning the wonders, and put pieces into a poem as a kind of list of things to learn and do in childhood. 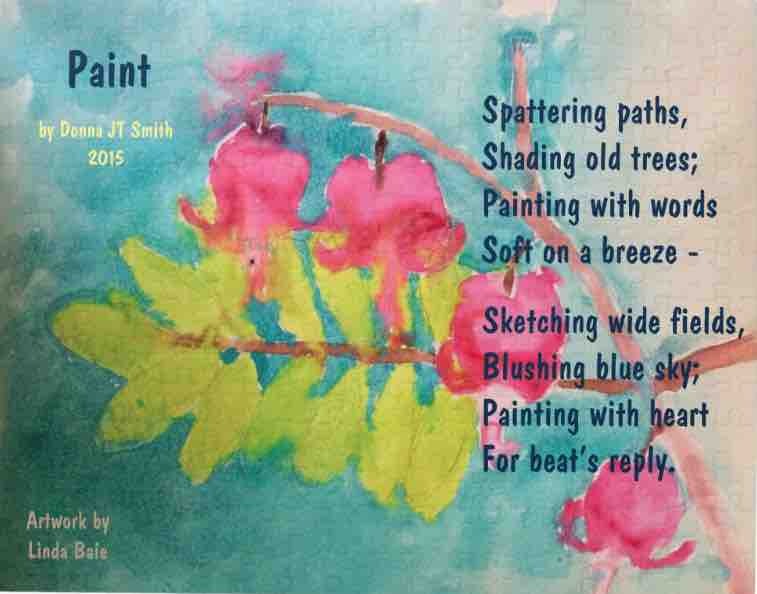 Because she didn't have a picture I could use, I painted a watercolor of a heart to superimpose the poem on...and of course, used Joy's name in the title! And my final swap was with Irene Latham. First, I wanted to use her OLW "Wild" in the poem. What's wilder than a tiger? I found pictures of her family's visit with baby tigers and couldn't resist the image of Boris. 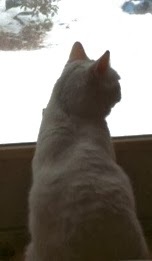 Boris, so large and in charge - for a little guy! 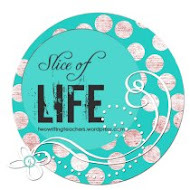 It's Slice of Life Tuesday - Join others and read more snippets of life on a Tuesday at Two Writing Teachers! It's been too hot in Maine recently. On Sunday it was 88 degrees with 95% humidity. That is totally unacceptable to me, but not unexpected. I know, I know, some of you have had over 200 degrees and 195% humidity - and in summers past we have had that, too, even in the years when we were told that another Ice Age was imminent. Please don't tell me you don't remember that. 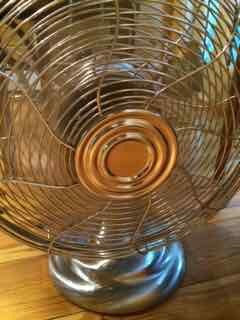 If you do, you are too young, and you probably have air conditioning and not fans! The thing about Maine is that we get lots of different kids of weather all the time. 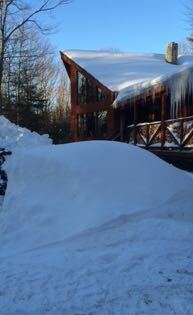 That's the predictability of Maine weather - that it is unpredictable. Some would like to attribute EVERYTHING that happens nowadays to climate change/global warming/ etc. But if they were really looking at the weather over the years in Maine, they would find that ANYTHING has ALWAYS happened here - and really everywhere else for that matter - it's cyclical. When I was a kid in Maine, we got the deep and frequent snows that we had this past winter, and it happened a few winters in between my childhood and now. We had summers so hot you thought you could fry an egg on the pavement - though who is going to eat that egg? And I remember the summer my feet got badly burned when I went for a walk barefoot on the road sometime during my invincible years. But it has also snowed in June in my lifetime and we've had many January thaws that give you a brief glimpse of spring in mid-winter. We've had summers when it rained EVERY weekend, starting on Wednesday. We've had summers when things dried up and blew away to look for rain. We've had flooding and hurricanes, earthquakes and tornadoes, blizzards and ice storms causing loss of power for a week or more. These are not everyday occurrences, but they do happen and have happened off and on over the past 60 years of MY recorded history. 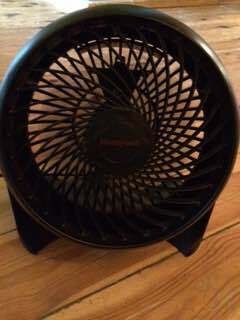 Fan #3 - The "Honey"
So I am not going to blame anyone or anything for how hot it has been this week. We've always had a week when you wish you had AC. We never know when that week will be until it happens. This year it is happening this week. 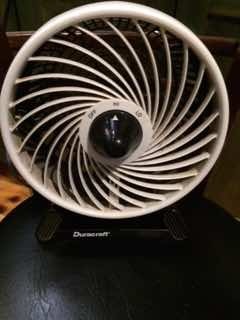 It can stop any time now, I'm still not getting AC more cooling than my four fans. I have officially noted this warm weather, recording it for future generations living in the Ice Age that should have been mine! 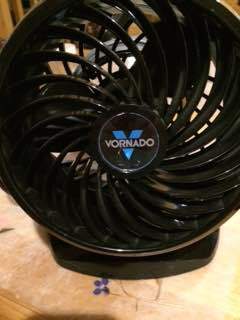 Fan #4 - New and improved Mr. Vorna-Dud. Meanwhile, I'm officially beginning preparations for December. I'm going to go find my mittens and boots. I'm ready for winter's predictable unpredictability now. I promise not to complain. 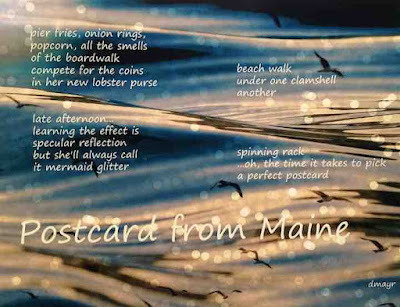 Both poems today, have a very "Made in Maine" feel to them, maybe because they aren't from so very far away - one from Heidi Mordhorst (of My Juicy Little Universe) in Maryland, and the other from Diane Mayr (at Random Noodling) in New Hampshire. 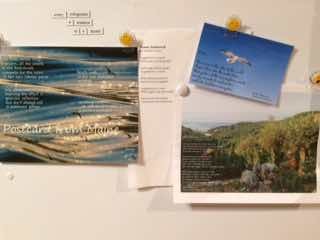 I really enjoyed the images attached to these two poems, too. They, with my recent picture taken at the beach nearby, prompted my own poem which I am posting at the end. Here is the swap from Heidi Mordhorst, who has written an Ode. I believe if you click on the image you will see it larger. I've written the poem below, just in case that doesn't work. of purple-passion'd phrase and exclamation! Who hath spoiled the joy of Poesy? O flowery Romantic, it is thee! with truth. Only the bee is fast. 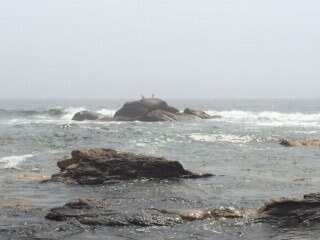 The rocks are rough; the sea is rippled smooth. and deep. I count small steps, not strides. Let green be silver, yellow, lime. Let minutes tickle by in thyme. Stone and salty water burn and soothe. Thank you, Heidi, for this beautiful poem. The image is much like the views from any hilltop (or mountain, as we would call it) in Maine. I like this ode in its whole, and many pieces in particular stand out as so meaningful to me. But perhaps my favorite one to say is "The day is new and blue; the view is vast with truth..." because I feel that inside when I see the blue sky and land stretching before me. But there are so many parts that ring true to me that I hate picking out just one part. "Stone and salty water burn and soothe." Lovely, Heidi! 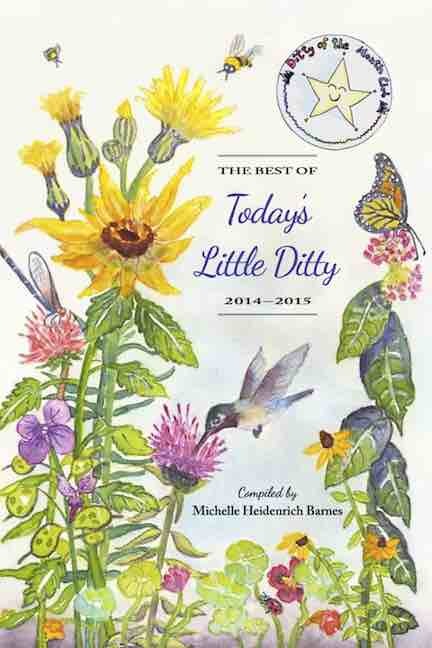 Thank you for a soothing, yet invigorating poem that will be read over and over. 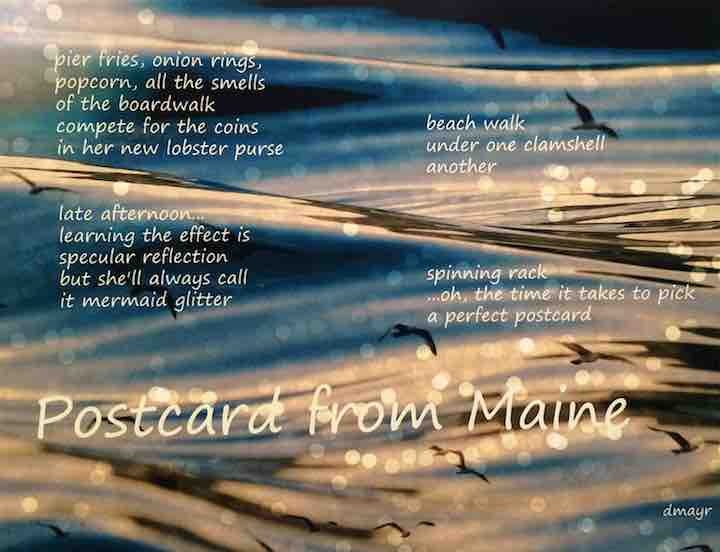 Diane's poem reminds me of how as a child, though I may not have had a "lobster purse", when traveling with my grandparents, they were sure to stop at "tourist traps" and get a few trinkets for me. But my favorite things ultimately were the sparkling "mermaid glitter" reflections and collecting rocks and shells. Postcards, back then, were also a big part of sharing summer fun with family and friends...so Diane has pretty much captured many of my snippets of memories! And what a gorgeous image! I love how the seagulls seem to be reflected in the waves, as well as the glittery sunlight. Thanks, Diane! I love it! Hope you are enjoying this beautiful Poetry Friday! Keep enjoying by visiting the poetry roundup hosted by Heidi Mordhorst at My Juicy Little Universe. Hey, isn't that who sent me a poem for the swap? I believe so! Hello, Poetry Fridayers! Our hostess for the roundup this week is the lovely dudette, Tabatha Yeatts, at The Opposite of Indifference. Go there for some links to good poetry fare. Good friends of ours are adopting a boy in China. He is 13 and has been waiting forever for a family. He is getting one now! 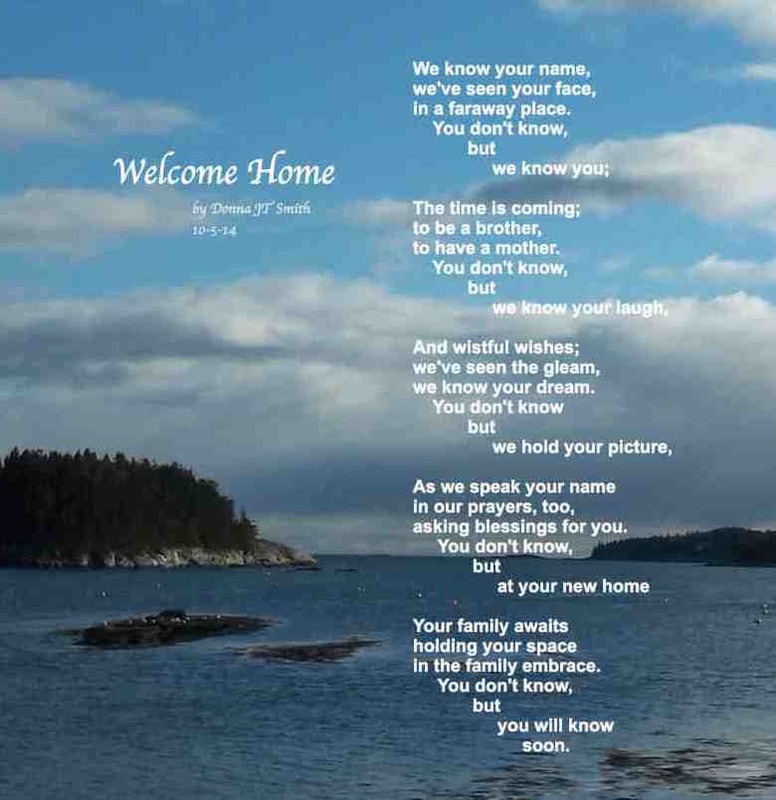 I wrote this poem for him when they knew he would be their son sometime - but he did not know yet that there was a family working hard at preparing to adopt him. It seemed so strange that someone so far away could be suddenly nestled so deep in your heart, and that so much work was going on in the process of adopting with approvals, home visits, classes, paperwork and finances, without the person being aware of any of this - all this flurry of activity, all the pictures on friends' refrigerators, all the prayers. But he is left out of the process for months in case anything were to fall through and the adoption process halted. We had even heard his voice on video before he had an inkling that a family was preparing to make him their son. It struck me, and I had to write. He knows now. He has seen pictures and read letters. We saw video of him reading the translated letter from his new family. I can hardly wait to meet this new member of their family! What a happy change in so many lives! PS Now I can say it on my blog - he's coming home with his family TODAY! How exciting is that? I have been quiet recently because my daughter came for a visit and brought my two grandchildren with her. I cannot write when they visit. It is much too busy and when it isn't busy, I am much too tired. Consequently, the writing suffers. Too bad for you writing. I'm otherwise engaged, body and soul. We had a wonderful visit, and worked on a project together for almost two weeks. It required working a couple of late nights, with Grampie babysitting the "soon to be four year old" making trips to the shore and Cabela's (their favorite place to go). Today (the 4th) they went home. What an quiet, empty house after the giggles, squeals and screams (mostly good screams, though we had a few mishaps!) of the last two weeks. I could use a good scream. It's pretty quiet here now. 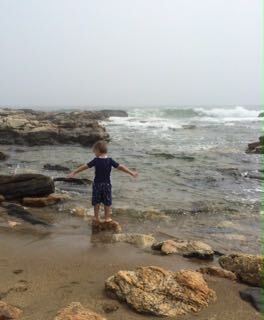 There's nothing quite like the cold ocean, salty breezes, rocks, shells, seaweed, and a little boy loving it all. What a beautiful time we had. if i could have You near to me.